Welcome to my garden. I have chosen a few pictures from my 1996 garden for your enjoyment. My home is located in North Idaho, USA about 100 miles south of the Canadian border. (Climate zone 5) The image map above (it is not to scale) will give you an idea of where in my yard the plants are. The lot is about .4 of an acre and with the exception of the front yard, all of it is sloping downward on the sides and rear. The blue at the top of the image represents a very small lake (no motorized boats allowed). 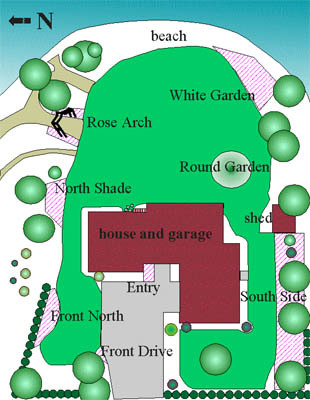 You may choose to visit different parts of my garden by moving the mouse over the image or you can click on these links: Front Drive, Entry, Front North, North Shade, Rose Arch, White Garden, Round Garden, South Side. You may enter the garden at any link and use the NEXT link to continue around the yard.